'The Treehouse' - Luxury, Location and Privacy! The TREEHOUSE is a private house with central air-conditioning. With more than 2,000 sq ft, we offer three large bedrooms & three luxurious baths. With high-end furnishings from Pottery Barn, Crate & Barrel and Restoration Hardware, this truly stylish home will make you feel like you are in an elegant treehouse in a private, wooded setting, yet only a 5 minute stroll to where all the action is! There is no place like OGUNQUIT in the summer! And there is no place in Ogunquit like THE TREEHOUSE! 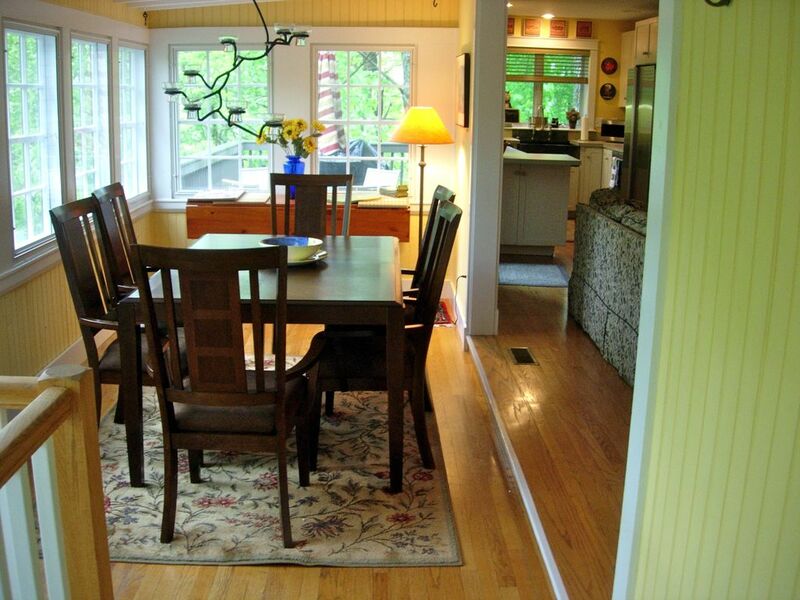 The TREEHOUSE is ideally located, just a 5 minute walk from the center of Ogunquit and 10 minutes by foot to the beach. The upper level has two bedrooms, two luxurious baths, a gourmet kitchen with stainless steel appliances, a living room with a wood-burning fireplace, a dining room/sun porch, and a breakfast nook. There is a complete entertainment center on this level plus a door to the upper deck with a seating area and a Weber gas grill. On the lower level is the third bedroom with a private bath with custom European-style tile shower. There is a second fully-equipped gourmet kitchen, a large living area. The living area has a brand new leather a sleep sofa that opens to a very comfortable double bed. There is also a gas fireplace and a complete entertainment center. From the lower level, you may enter the large lower deck. On this lower deck, there is a large dining table with umbrella and six chairs - perfect for al fresco dining - as well as additional lounge furniture, and a Weber gas grille. There are beautiful hardwood floors throughout the house, plus we provide free wireless Internet, cable TV, DVD, CD. There is a full-size washer and dryer for your use while in residence. We supply all linens & towels (except beach towels). We are open year round! Guests enjoy Thanksgiving, Christmas and other holidays and times of the year at our lovely home. Ask us to send you the document we have created called 'A CLOSER LOOK AT THE TREEHOUSE'. It contains more photos and info about the Treehouse and about Ogunquit. The TREEHOUSE is available throughout the year - check out our great off-season rates! Ogunquit means "Beautiful place by the Sea"! And Ogunquit is beautiful throughout the year. During the peak summer months, we rent only by the week, from Saturday to Saturday. Three night minimum rentals are also available between October and May. Be sure to read our 5-star guest reviews! Holiday week-ends may be higher. Inquire about rates for long weekends (3-night minimum stay) during off-season months (October through May)!!! Nightly rates vary from $300.00 to $625.00 and are available only during off-season. The TREEHOUSE is a private house with central AC. With more than 2,000 sq ft, the Treehouse has three large bedrooms and three luxurious baths with high-end furnishings from Pottery Barn, Crate & Barrel and Restoration Hardware. This truly stylish home will make you feel like you are in an elegant treehouse in a private, wooded setting, yet only 10 minutes from the main beach. The upper level has two bedrooms, two luxurious baths, a gourmet kitchen with stainless steel appliances, a living room with a wood fireplace, dining room/sun porch, and a deck with a Weber gas grille. On the lower level is the third bedroom with a private bath with custom tile shower. Also on the lower level is the second gourmet kitchen, another large living area with a sleep sofa, a beautiful gas fireplace and an entertainment center. From the lower level, you may enter the large deck where there is a table for six with umbrella and chairs for al fresco dining, as well as additional lounge furniture, and a Weber gas grille. We provide free wireless internet service, Cable TV, DVD and CD players and a full-size washer and dryer for your use. Ask us to email you 'A CLOSER LOOK AT THE TREEHOUSE' for more info & photos! You will get the best night's sleep on any of the queen beds, all of which come with high-end comforters/quilts from Pottery Barn, Crate and Barrel or Restoration Hardware. The master bedroom on the upper floor has a queen bed and an en suite bathroom with marble floor, marble top antique vanity and claw foot tub with shower. There is also a great built-in dresser. The second bedroom on the upper floor has a queen bed, large closet and has a luxurious bath with a large, custom tiled European style shower. You will appreciate the wonderful lighting. The bedroom on the lower level is very bright and spacious with a queen bed and an oversized en suite bathroom with a custom tiled European style shower. In the living room area on the lower level, there is a full-size sleep sofa that opens to sleep two people. There is a TV in both living areas and each is equipped to play DVDs and VHS tapes. Digital Cable TV with over 195 channels, including more than 25 Free On Demand channels and more than 45 Digital Music channels. We also maintain a library with scores of movies on DVD and VHS, for your viewing pleasure. There are two stereo CD players and a separate library of CDs for your listening pleasure. There are two Weber gas grills - one on the upper deck and another on the lower deck. On the huge deck on lower level, there is a table for six with umbrella and chairs for al fresco dining, as well as additional lounge furniture. What makes the TREEHOUSE unique? It would be hard to find another vacation rental that is a private HOUSE, that offers THREE large bedrooms with THREE luxurious BATHROOMS, that is fully AIR-CONDITIONED and is within an easy stroll to where all the action is! The TREEHOUSE is a third of a mile to the center of town and a half a mile to the main beach! At the TREEHOUSE, we invite you to engage in whatever leisure activities you choose during the day and then to enjoy either a casual or an elegant evening at the Treehouse. With two fully-equipped gourmet kitchens, two spacious living rooms and two decks, you are welcome to enjoy your own private and secluded Treehouse as you wish. We supply all linen and towels (except beach towels). And if you really want to know what makes the TREEHOUSE unique, read reviews written by previous vacation renters! We could not have said it better! *Inquire about long weekend rates (minimum 3 nights) during off-season! Need Privacy, Separation and Space? Do you sometimes need your own space or privacy from the rest of your crew when on vacation? Then this place is for you. The upper level has two bedrooms, two baths, a full kitchen, living room, dining/sun porch, and an outside deck with a Weber gas grille. The lower level has its own full kitchen, living area, dining area, bedroom and bath - and a large outside deck, also with a Weber gas grille. The living areas on both levels each have cable TV, DVD player and stereo/CD player as well. It's a very comfortable setup for families traveling with parents or in-laws desiring their separate space, yet being close to the rest of the 'gang'. Or perhaps you want the kids traveling in your group to have their own space (so you can have your privacy), yet have them close. Each bathroom is very large and well-appointed with wonderful lighting and custom features. A claw foot tub with shower in the master bathroom. European-style showers in oversized guest bathrooms. The Treehouse is less than 10 minutes by foot to one of the most beautiful beaches in the States. The Treehouse is centrally air-conditioned. The Treehouse is available year-round. We supply all towels and linens (but not beach towels). There is a full-size washer and dryer for your use. The Treehouse has two fireplaces - a beautiful wood-burning fireplace on the upper level and a beautiful gas fireplace on the lower level. Strong wireless signal from anywhere on property. There are two living rooms. One on the upper level and one on the lower level, both with a TV and full entertainment center. (2) There are two full-size dishwashers, one in each of the two kitchens. (2) There is an ice-maker in both refrigerators. (2) There are two full-size stoves with oven, one in each of two kitchens. (2) There are two microwave ovens, one in each of the two kitchens. There are two coffee makers, one in each of the two kitchens. (2) There are two toaters, one in each of the two kitchens. A complete set of dinnerware service for 10 from Bloomingdales is available for your use. (2) There are two fully-equipped gourmet kitchens - one on the upper level and another fully-equipped gourmet kitchen on the lower level. There are two dining areas indoors, as well as a breakfast nook. Outdoor dining on the either of the decks can be great fun. There is a Weber gas grill on the upper deck & another on the lower deck. (2) There are two cable TVs equipped to play DVDs or VHS tapes, one in each of the two entertainment centers, one on the upper level and the other on the lower level. A separate library of CDs of every taste, for your listening pleasure. A separate library of scores of movies on DVD and VHS for your viewing pleasure. (2) We offer two gas grills. There is one Weber gas grill on the upper deck, with seating. The huge lower deck also has a Weber gas grill and a table for six, as well as lounge furniture. The TREEHOUSE is a private house with central air-conditioning. With more than 2,000 sq ft, we offer three large bedrooms & three luxurious baths. It is a 5-minute stroll to where all the action is! With high-end furnishings from Pottery Barn, Crate & Barrel and Restoration Hardware, this truly stylish home will make you feel like you are in an elegant treehouse in a private, wooded setting, yet only 10 minutes from the main beach. The upper level has two bedrooms, two luxurious baths, a gourmet kitchen with stainless steel appliances, a living room with a wood fireplace, dining room/sun porch, & a deck with a Weber gas grill. Below is the 3rd bedroom with a private bath with custom tile shower, the 2nd gourmet kitchen, a large living area with a sleep sofa, a gas fireplace and 2nd huge deck. Washer/dryer. Hardwood floors, free wireless internet. We supply all linens & towels. We are open year round! For more info and photos, request: 'A CLOSER LOOK AT THE TREEHOUSE'! The property was nice, but, the furniture was uncomfortable and dated. The outside areas were not well cared for. There were no extra pillows or blankets available. The televisions are very small and not placed well for viewing. The property was not available at check/in time. Had to wait outside for over an hour for someone to bring keys. "We absolutely loved the tree house" - is exactly what John texted to me on the day he checked out. Needless to say, I am surprised at this review. There was confusion that delayed his check-in by an hour. I apologized to him when I learned of that situation and I worked to resolve it quickly. Later, I followed up to be sure that he and his guests were finding everything to be in good order. I received no comments or complaints from him. His suggestion of extra pillows is a good one but there are, in fact, extra blankets for each bedroom and notes that explain where to find them. After checking out, John contacted me to let me know that John's husband had left behind his wedding ring. We located it and gladly shipped it to them. John seemed pleased when he confirmed receipt of the ring. It arrived safely within three business days. I had the impression that they might be among the many guests who returning in the future. I've contacted John to let him know that we are sorry that we disappointed him and that we always welcome feedback. It is important for us to know how people react to our Treehouse. We make changes and improvements regularly, often based on guest's comments. I hope to hear back from him. We have owned and operated the Treehouse for ten years and have known that something might go wrong at some point. That notion encourages us to work even harder to make sure that things go right. Perhaps one day we will have the chance to meet and exceed John's expectations. This is like home away from home! The beds are comfortable, the kitchen had everything we needed. There are plenty of towels. The grills are clean and easy to use.The location is great and is within easy walking distance to everything. David is a fabulous host. He gave suggestions about places to go and things to do. We had a wonderful time and would definitely come back! Thanks, Debbie and Mike, for your kind words! I am thrilled that you had such a great time! I enjoyed seeing all the photos you posted on FaceBook of all the wonderful times you had enjoying yourselves as you discovered the magic of New England and Maine and Ogunquit and the Treehouse! Please plan to come back and please be sure to tell all your friends about the Treehouse! I'm sure you will! Ha! Rob! Thanks for the great review! We look forward to having you back again next year. Rented the Treehouse for a birthday celebration and loved it. It is a very clean and comfortable space for 8 adults. The interior design is lovely. The kitchen is stocked with everything you need if you like to cook. It was nice that it had 2 kitchens. Multiple bathrooms is another plus. Great quiet location with an easy walk to town and beach. David was always available for questions and helpful tips. Ogunquit is beautiful. If you do go, take in a play at the Ogunquit Playhouse. We definitely plan to stay at the Treehouse again. Thank you, Ann, for such a great review! Our goal at the Treehouse is that each guest will find a home away from home. I am delighted that you and your guests enjoyed the Treehouse and all we have to offer. We look forward to having you stay at the Treehouse again soon! Great location. Great layout. Everything you need. We have been coming to Ogunquit for 30 years and know the area well this was an easy location to town and the beach. With all you could need in the house. If only they took pets. Thanks, Rachel, for your great review and your thoughts about pets. We love pets and, in fact, have two dogs of our own. We need to consider the allergy issues of other guests but we may consider offering this in the future. Thanks for the suggestion! Just as wonderful as we remembered! We returned to the Treehouse for the first time in eight years. There was a cleaning service snafu when we arrived, but David Shepherd, the owner, addressed it immediately, completely and thoughtfully. We appreciated that very much. We had a wonderful week and the Treehouse didn't disappoint. The pictures are accurate. It is a great place for families. We came with both of our daughters' families, including three grandchildren, one an infant. There is wonderful space for being together or spreading out. We ,loved eating together in the upstairs dining area and visiting on the downstairs deck. The Treehouse is private and secluded but within walking distance of the village and beach. We hope to go back again next year. We would strongly recommend the Treehouse for anyone looking for a wonderful vacation destination. Dave! Thanks for the great review. I remember when you were here 8 years ago and I was looking forward to your return and hoping that all was perfect for you and your family. I am so pleased that your vacation was such a success. Ogunquit is only 66 miles north of Boston, 4.5 hours from NYC. It is served by three airports, an Amtrak line, and right off I-95. Route 95 North to 91 North to 84 East to 90 East (Mass Pike) to 290 East to 495 North to 95 North. Cross Piscataqua Bridge to Exit 7 – The Yorks/Ogunquit. Get off exit and follow signs to Route One north. Stay on Route One north for 7.3 miles and you will be in the center of Ogunquit! The Treehouse is a short stroll to the town center with all the great restaurants, bars, and shopping Ogunquit has to offer. The main beach is less than half a mile away. Near the town center, you will find an entrance to the Marginal Way, which leads you on a picturesque one mile pedestrian pathway along the rocky coast to charming Perkins Cove where you will find more great restaurants and shops, as well as access to sailing, fishing and sightseeing boat excursions. The Ogunquit Playhouse is one of the top 10 off-Broadway theaters! Golf: Golf: The Treehouse is very close to several golf courses that are open to the public. Cape Neddick Country Club 361-2011 in York is now a semi-private course. The golf course is open to public during the shoulder seasons: April 15 until Memorial Day weekend and after Labor Day until November 15. The Treehouse is a proud member of the Ogunquit Chamber of Commerce. Check out its website. Call or email to book or for more information. Nightly rates vary from $300.00 to $650.00 and are available only during off-season. BOOKING process: In the peak summer season, we book only by the week, from Saturday to Saturday. From October to May, we have a three-night minimum rental policy. $2,100.00 - $4,000.00 per week ~~~ $300.00 - $625.00 per night All rates are subject to a 9% State of Maine lodging tax. A (refundable) security deposit of $500.00 required. Weekend rates (minimum 3 nights) may be available during off-season. We provide linens and towels (but not beach towels). Ask us to send you 'A Closer Look at the Treehouse' for more photos and info.